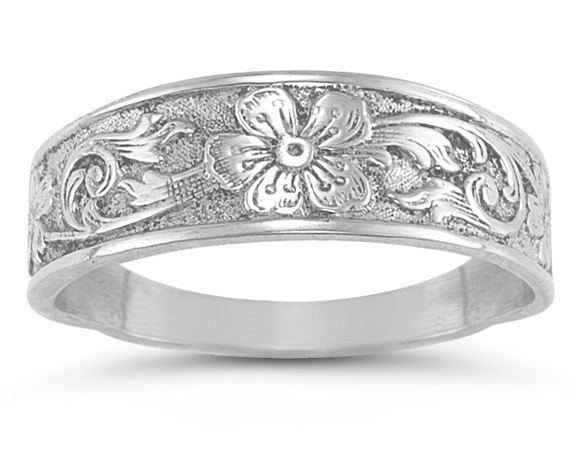 A vintage-style paisley flower band in .925 sterling silver from around the 1800s period. What makes this antique-style ring exceptionally unique is that it is not merely from the imagination of a jewelry designer, but an actual vintage ring made from the original jewelry-making hubs from circa the 1800s period. This vintage ring is also available in 14k white gold (shown below). We guarantee our Vintage Paisley Flower Band in Sterling Silver to be high quality, authentic jewelry, as described above.